We are still accepting sponsors for 2018. Interested in supporting women empowerment, young professional development, and community building? For more information on packages available and custom partnership opportunities, please email Ad 2 Sponsorship Chair at andrew.swisher@adfed.org. As a non-profit organization, sponsorship enables Ad 2 to provide consistent, quality programming while keeping ticket costs to a minimum. We also hope to provide avenues for our attendees to build relationships with brands who partner with us that align with their personal and professional aspirations, leading to long-lasting connections. We are grateful to those who have helped build the strong foundation of Women’s Leadership Panel through their sponsorship over the years and look forward to creating space for even more growth in the future. The Advertising Federation of Minnesota (Ad Fed) is a non-profit, professional trade association that has served the Minnesota advertising community including agencies, advertisers, suppliers, and students, for more than 112 years. Ad Fed is a part of The American Advertising Federation (AAF), the nation’s oldest national advertising trade association. Ad Fed members volunteer their time and talents to plan and execute events that are overseen by a board of directors. Ad Fed offers networking opportunities, seminars, speaker presentations and other fun and industry focused events, plus legislative efforts both in MN and DC. It celebrates the Twin Cities’ market strength and the global impact that our community makes through leading brands, creative advertising campaigns, and sound business practices. Ad 2 is an affiliate of the American Advertising Federation (Ad Fed), reflecting memberships made for ages 32 and under. 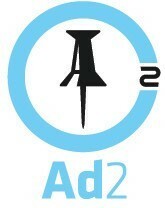 Ad 2 represents the future of advertising through its ability to unite young, talented professionals as one group. Together, Ad 2 creates a means for up and coming professionals in the industry to gain the contacts, education and leadership opportunities they need to become tomorrowʼs industry leaders. Ad 2 focuses on meeting the needs of young professionals through educational and networking events, and public service opportunities.